If you think dentures or dental implants are only for the elderly, think again! In 2015, it was reported that 53% of people with dentures began wearing them before the age of 44. Dentures and dental implants are much more common than you think. Before you proceed with either of these dental procedures, you'll need to know which option is right for you. We'll weigh the pros and cons of dental implants vs dentures. When you're finished reading, you'll have a much better idea of which solution is most appropriate for your situation. While both dental implants and dentures offer effective solutions to replace missing teeth, one option is temporary and the other is permanent. Dentures are not fixed in the mouth. Individuals take them out at night and do not sleep with their dentures. They may find dentures uncomfortable at times and may not be able to eat certain foods. Others may find dentures to be a suitable long-term solution for themselves. Dental implants, on the other hand, are permanent. They are surgically planted into your mouth and function as normal teeth. You do not remove implants yourself, and you wear them 24 hours a day. Dental implants may limit your consumption of certain foods, but this is not typically as pronounced as with dentures. Dental implants are a permanent solution, as stated previously. Your dentist or oral surgeon will anchor them into your mouth with metal posts. You can select a full arch of dental implants or a partial set, if you are missing several teeth in a row. 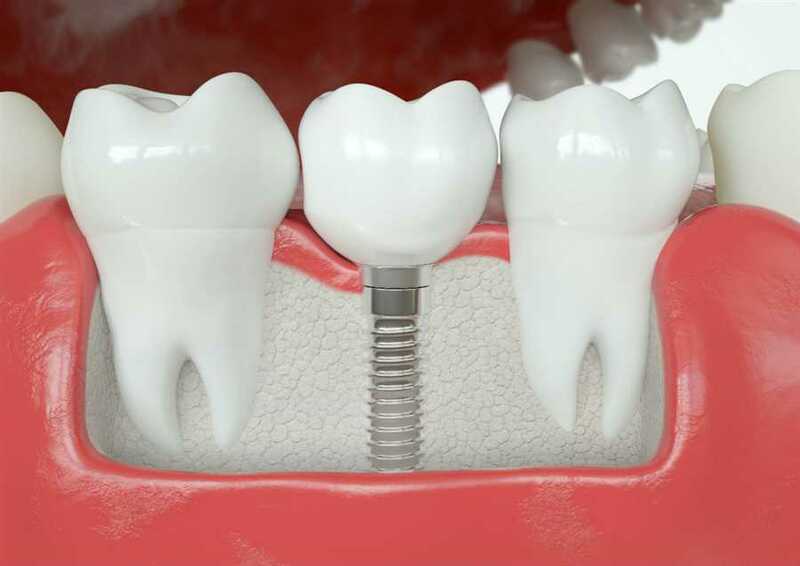 A dental implant should function like a normal tooth. Most people find they can still eat any type of food they desire with dental implants. While some individuals have dental implants replaced at some point in their lives, most dental implants are placed for the long-haul. They are designed to serve as a long-lasting and permanent solution to replace missing teeth. Unlike dentures, they are not likely to randomly fall out or slip out of place. They don't require cream or special care for you to ensure they remain clean and nice looking. You simply need to brush them in the same manner that you brush your normal teeth. Additionally, it is important to note that dental implants preserve your jawbone. Your jawbone begins to decline and becomes more prominent as you age. This is especially true when you wear dentures. Many older people struggle with sunken cheeks, mostly as a result of missing teeth. While dentures can correct that slightly, it isn't a permanent correction. When you remove your dentures, your cheeks will sink inward. Over time, your cheeks may sink in more and more so that it is prominent, even with your dentures. There are not many cons to dental implants. For some individuals, they may be cost prohibitive. Dental implants are much more expensive than dentures and are often not a viable solution for people without dental insurance. Another disadvantage of dental implants is that they can’t be placed on individuals who have had gum disease, weak gums, or poor oral health. This is primarily due to the fact that the screws keeping the dental implants in place would further destroy your already weak gums. A final limiting aspect of dental implants revolves around their perception of being a permanent solution. Contrary to popular belief, they only have a life of 15 to 25 years. This may not be long enough for some individuals and require people to make significant dental investments in the later years of life. The very economical cost of dentures is the most glaring advantage for most individuals. Dentures are much more cost effective and a better tooth replacement solution for those on a budget. While they may not be as visually appealing or as easy to wear as dental implants, many people select dentures because of their much lower price point. Dentures are also great for individuals who have weak gums or gums that are not as healthy as ideal. Considering that the dentures are positioned on top of your gums, they will not cause further damage. Dental implants were developed due to the many disadvantages people face with dentures. The most glaring challenge with dentures is that they often slip out of place, even when an adhesive is being used to secure them. Dentures often require that you apply messy gels and glues to keep the dentures in place. Another disadvantage of dentures is their tendency to fall out at inopportune times. Many individuals claim that dentures are not comfortable at all and avoid wearing them due to the discomfort. Denture wearers often report that they have trouble chewing food. Many times, hard foods are fully off limits because of the denture's propensity to slip and slide in their mouths. A third challenge with dentures is the struggle to keep them clean! While most people believe they properly take care of their dentures, this isn't always the case. You need to perform extra maintenance on dentures to ensure that your false teeth stay clean. This is extremely important because the dentures can cause oral infections if they pick up bacteria. A final disadvantage of dentures is their requirement to be fitted at regular intervals. The shape of your mouth constantly changes when you don’t have teeth. As a result, dentures require constant adjustments and may need to be changed often. While the initial investment is lower than dental implants, there typically is more ongoing, maintenance cost required. Should I Choose Dentures or Dental Implants? In the battle of dental implants vs dentures, the ultimate decision is up to you. You should do as much research as possible on both options and speak to your dentist or oral surgeon about your concerns. The dental provider will be able to guide you and help you determine which option works best for your mouth and your situation. You'll be on your way to a brighter smile and future once you've implemented your tooth replacement strategy. For more information on options to replace your missing teeth and what might work best for you, contact our office directly.